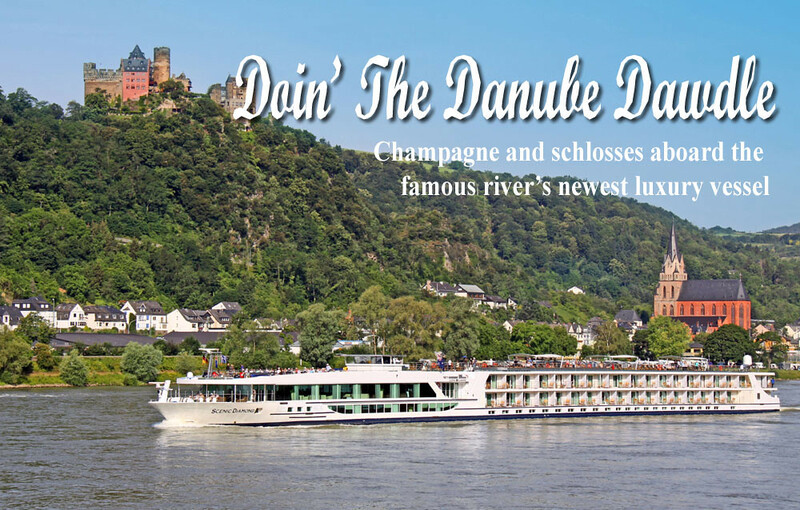 Not to be outdone by Cruise Weekly's newest convert to luxury European river cruising, editor Louise Goldsbury, this writer and TD TV's Barry Matheson went off to explore another contender to the title of Queen of the Danube, Scenic Pearl. I certainly concur with Louise's observations that river cruising is a fantastic way to explore Europe. The most sought after destinations are right there on the river bank, just tie up and wander ashore. A fleet of brand new Scenic Tours buses follow the ship along the entire route, providing instant shore transport as required for day trips and excursions. My previous river cruising experience on the Mekong, Amazon, Murray, Yangtze and Columbia were quite different affairs but each demonstrated the harmonious and effortless method of sightseeing and touring without the grinding ordeal of airports, buses, train stations or check-ins and check-outs. Scenic Tours' so-called 'Space Ships' are each 135m in length and offer some 22 per cent more room than comparable vessels. This extra length is translated into larger suites and public spaces. The Crystal Dining Restaurant will seat all 169 passengers in a single sitting, plus there is the fine dining in the Portobello Restaurant and in-room for suite passengers – served by their private butler. Of the 85 cabins, 82 per cent have balconies with picture windows, ideal for watching the gorgeous riverside scenery roll past in a continuous canvas. And, of course, there is the huge rooftop sun deck and expansive Panorama Lounge & Bar. Scenic make a point of spruiking their 'All Inclusive' pricing, which certainly helps relieve post-holiday blues of coming home to huge credit bills for extras. This pricing includes all dining, beer and wine with meals, onboard activities, sightseeing tours, gratuities and, depending on your chosen category, laundry and Wi-Fi internet. The trump card of the Scenic itineraries are their exclusive 'ScenicEnrich' inclusions. Instead of a simple tour if the ornate Palace Lichtenstein in Vienna, a chamber orchestra is summoned to entertain you. In the incredible Benedictine Abbey at Melk, the regular tour is enhanced by a swirling organ recital inside the the cavernous, gold-encrusted chapel. Scenic Tours have a wide range of pre- and post-tour itineraries to chose from including Turkey, France, Mediterranean, Ireland, Scandinavia and Spain. Pricing, for example, starts from AU$5950 for the 15-day “Jewels of Europe” Amsterdam to Budapest river cruise (March 07, 2012. Cat E, twin share). This writer's tip would be to travel on the fringe of the high season eg April, May or September, October to avoid the high season crush and hotter weather. Earlybird pricing applies. Visit www.scenictours.com for full details, pricing and options.